Multi-purpose yoga, fitness, exercise and massage accessory, surface pattern with protrusions. Yoga Roller inSPORTline Cilindro is a universal yoga, fitness, exercise and massage accessory made of a durable and shock-absorbing PVC/EVA material. 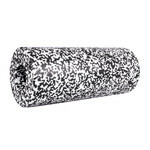 The multi-density surface pattern makes this bolster perfect for body massage, providing excellent muscle stimulation. Frequent use of the Yoga Roller inSPORTline Cilindro helps strengthen the body, improves the distribution of subcutaneous fat tissue, helps fighting cellulite, improves muscle flexibility, relieves muscle tension, reduces pain and improves blood circulation. Moreover, it relieves back pain, stabilizes the spine and helps maintain correct posture. 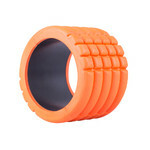 Last but not least, Yoga Roller inSPORTline Cilindro helps speed up recovery after injury. Moreover, its relatively small size makes this roller perfect for traveling and/or vacation.